Rare Aircraft – Arado Ar 79 | Achtung, Skyhawk! When the Messerschmitt Bf.108 first appeared on the European general aviation scene in the mid-30s, it had created something of a “Porsche moment”: here was a small and light tourer, astoundingly fast yet relatively low powered, agile but quite docile, so left-field in design that it had shocked in the same measure it had fascinated. More than anything else, it had finally dispelled most of the skepticism and antagonism toward the low-wing monoplane configuration for light aircraft (at least in Germany), showing just what could be done with this novel idea once you’ve put your mind to it. Pretty soon, this success had kicked off something of a “VW Beetle moment” :D. Seeing that the mentioned configuration does indeed work – and rather well at that – several manufacturers began seeing its potential to replace the lumbering open-cockpit biplanes then used for common day-to-day operations. What was needed here was a simple, cheap, robust and versatile no-frills machine that would efficiently go about its training and liaison duties, while still retaining that quantum leap in performance (and comfort!) over existing aircraft. Under various design heads, including fellow Fokker veteran Walter Rethel – who would later go on to become the chief engineer on the Bf.109 – the young company had soon gained a solid reputation in Germany for its advanced, mostly metal light biplane fighters and trainers. Indeed, the company’s Ar 64 and Ar 68 were among the first combat aircraft produced in Germany after the Versailles Treaty was… ignored, and were the first front-line fighter aircraft to equip the new Luftwaffe. The majority of its pilots too were already familiar with Arado, having trained – in secrecy, under the guise of civilian aeroclubs – on the widespread civilian Ar 66 biplane trainer. 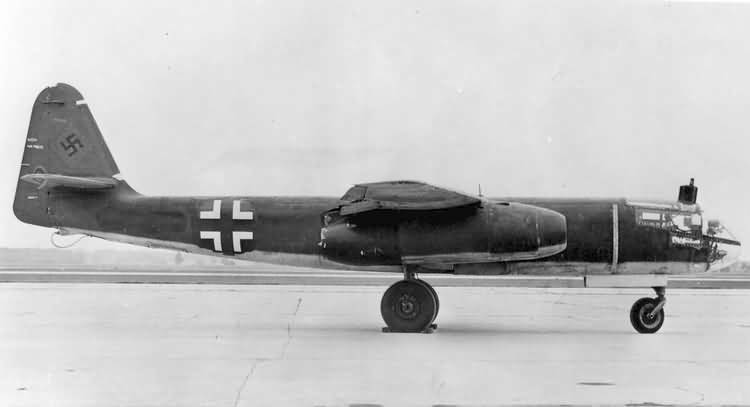 Despite these successes however, by the time the Luftwaffe was firmly on its feet Arado was already beginning to suffer from a slight case of “Messerschmittitis”. The animosity of several high-ranking German officials (most notably Erhard Milch) towards Willy Messerschmitt is well documented, having been a significant factor in undermining Bayerische Flugzeugwerke during the pre-war years, despite the demonstrated ingenuity – and outright superiority – of several Messerschmitt designs. Heinrich Lübbe’s refusal to join the Nazi Party had had a similar effect, though in the end far more reaching: with the Party’s patience finally running out in 1936, Lübbe was removed from his position and Arado promptly nationalized. Back in more successful pre-war times, the Ar 79 had – as mentioned – represented the company’s attempt to design a cheap & cheerful modern light aircraft that would lend itself well to common, non-utility tasks. Unusually, despite it being 1938, it was designed for the civil market only and very few were actually used in military roles – odd given the many aircraft of all types then being pressed into Luftwaffe service (more so when you consider that a majority of early German transports and bombers were designs that had started out as passenger aircraft for Lufthansa). At a glance from a distance, the Ar 79 looked very much like a Bf.108 – and keeping in mind that there is only a number ways you can design a low-wing monoplane taildragger, we can’t hold that against it. Up close however, there were some notable differences, the biggest being the odd vertical stabilizer. Introduced on the Ar 68 in 1934, it would become the trademark of all subsequent Arado piston singles – however, I’ve not been able to find out exactly what advantages did the design give. But – using a bit of Eyeball Mk.I extrapolation – its near-vertical leading edge reminds me of the stabilizers on Mooneys, which are designed to give better control response in stall and near-stall situations. And given that most Arado singles were trainers likely to be spending quite some time there, it does sound plausible. So far, so Bf.108-ish. However, once you look below the skin – or at it for that matter – things start to go awry. Unlike the all-metal 108, the Ar 79 was a somewhat unusual mix of metal, wood and fabric, everything from the modern to the utterly conventional. Starting out back, the rear fuselage was an advanced magnesium alloy (!) (or “electron casting”) monocoque structure. In this type of construction, pioneered during the first decade of flight, the skin itself is the only load-bearing element – it is the only thing making up the structure, without any form of internal support. Contrary to what I had assumed, this had made the Ar 79’s rear end very light, much lighter than it would have been had more commonplace solutions been used. In addition, this type of construction had also paid off in simplicity and strength, with its oval shape spreading the load evenly around the fuselage and the (predominantly) one-piece structure removing the need for rivets, joints, welds or other such structural weak points (in later years, in an effort to reduce weight when applied to larger aircraft, this structure would evolve into what’s known as the semi-monocoque, which combines the load-bearing skin with an internal bracing frame, permitting the metal to be thinner and thus lighter, while still keeping many of the monocoque‘s qualities. In this form it has been used on airliners since the 50s, where it’s load bearing characteristics have been put to good use at battling the stress of pressurization 🙂 ). EDIT: I would also like to extend my sincere thanks to Mr. Adolf Jaeger for correcting my erroneous assumption that this type of monocoque structure would be slightly heavier than conventional constructions. Everything considered, one could deduce that the Ar 79 had quite an interesting weight distribution: almost evenly balanced fore and aft, something rare in most aircraft :). This would have located the center of gravity somewhat more aft than normally found on similar aircraft – not that far aft that it became tricky to fly, but enough to make it stable and maneuverable in equal measure. And being otherwise fully aerobatic – equipped with an aerobatic carburettor, permitting inverted flight – this would have made the Ar 79 quite agile :). It had always been said that the true test of an aircraft was a long distance record flight. The Arado team had apparently taken this a bit close to heart, for when they rolled the above pictured D-EHCR back into the hangar, they decided they could just up its fuel capacity a bit… now, I couldn’t find the exact capacity of the standard tanks, but with a range of 553 NM at 110 kn and 5.2 GPH, it works out to 26 gallons, or 99 liters. This was felt to be somewhat inadequate, so what the engineers did was bolt a jettisonable 106 liter fuel tank under the fuselage and screw in a whopping 520 liter tank behind the cabin. In total, this gave 725 liters (!) to burn, which – at avgas’ standard specific gravity of 0.7 kg/l – weighed in at 508 kg and was 48 kg more than the empty weight of the plane :D.
This was deemed enough to give good record-breaking range and was put to good use between 29 and 31 December when a two man crew flew non-stop from Benghazi in Libya to Gaya in India – a distance of 6,303 km (3403 NM)! At an average cruise speed of 160 km/h (86 kn) that would have taken a tad more than 39 hours, quite a feat for an understated two-seat trainer groaning under its own weight in fuel 🙂 (though this fuel to weight ratio would certainly not be unique; the Rutan Voyager, which flew non-stop around the world in 1984 without refuelling, could carry more than 3 times its weight in avgas!). 4. From here to… obscurity? Apart from its record-breaking flights – flown mostly by the second prototype, which crashed in India about two months into 1939 – the Ar 79’s regular service life was quite uneventful. It’s versions were even scantier than those of the Bf.108, with only the Ar 79B, Ar 79D and Ar 79E seeing the light of day – and these differed only in minor equipment changes. 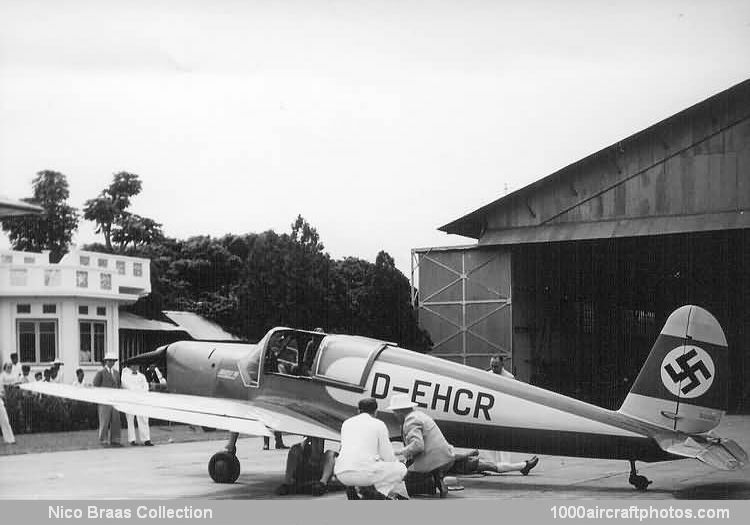 Some sources do state that the production models were fitted with Hirth HM 500A1 engines, rated at the same 105 HP, and that the 504 was used on the prototypes only. But, despite its flying qualities and proven performance over longer distances, in the end the Ar 79 was not really a sales success (though WW2 had much to do with it, the civilian general aviation sector virtually disappearing overnight): not counting the two prototypes, only 48 production models were built when production ceased after just three years, in 1941. Today, only one Ar 79 is known to have survived – thanks once more to the sterling efforts of Lufthansa’s historic flight, the Deutsche Lufthansa Berlin Stiftung. 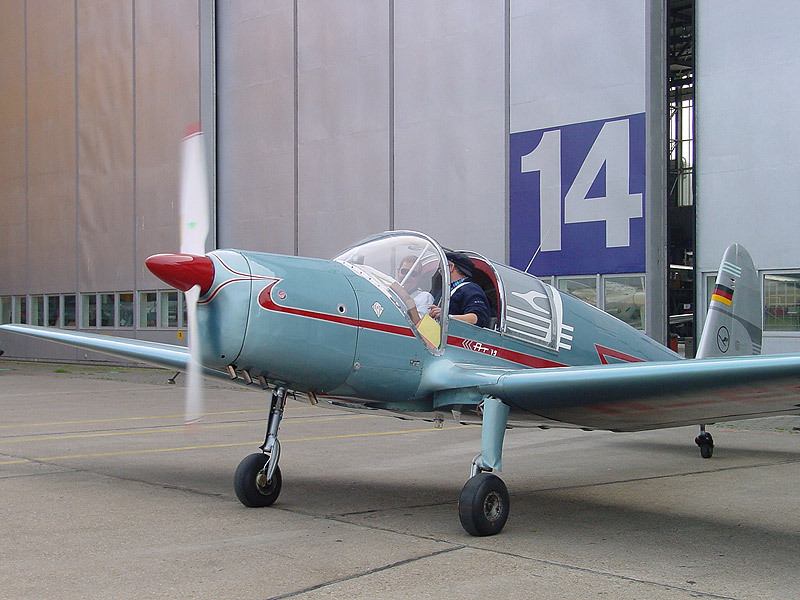 D-EMVT – an Ar 79B-1 and the next-to-last Ar 79 built – was meticulously restored in 1996 and kept in flying condition up till 2001, when it was put up as a permanent exhibit in the Deutsches Technikmuseum in Berlin, where it now hangs out for most of its days :). * Note: the biggest disparity in performance numbers I’ve found is in the weights. Most sources dealing with the B model put them at 526/850 kg, while two sources – which mostly covered the prototypes – put them at 460/760 kg. I haven’t found these numbers anywhere else, but it is entirely possible that the prototypes – given their record-breaking nature – were lightened by removal of equipment that was standard on the production versions. Your assumption of excessive weight of the monocoque rear fuselage is quite erronous.It was an electron casting (magnesium alloy) and it was significantly lighter than alternative methods of construction would have been. Thank you for the correction! I will look into this and correct the post as necessary (since it then also casts doubt on whether the CG was well back, so I have to recheck this as well). I’ve read somewhere that the trademark Arado tail arrangement had something to do with maintaining maximum stability in the roll. The fin assembly being forward of the tailplane, it wouldn’t be rendered ineffective by dead air left in the wake of the tailplane. Blackburn used a similar arrangement in the Skua fighter/dive-bomber. Robert, I must admit I have no reliable info about Ikarus – outside what can be found on the net – but I’d suggest you contact the Aeronautical Museum in Belgrade. They have a collection of Ikarus aircraft on display, have loads of tech documentation and are I believe the foremost experts on the marque :).